Culinary adventurers should look no further than our authentic concoctions that shun cost-driven methods in favor of generations-old recipes. Here, chili sauces are painstakingly made, dictated not by price points but rather the pursuit of perfection. All are available in 8 oz, 16 oz and 1 gallon (140 oz) sizes. 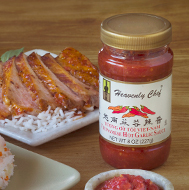 For extra fire, see the Edible Oils section for information on Heavenly Chef Hot Chili Oil. 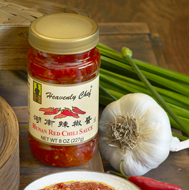 A chili sauce to satisfy the folks in Hunan, who consume prodigious amounts of it, does not arise by accident. This entrée earns kudos for faithfully delivering the fire and flavor these diehards demand. Vietnamese Hot Garlic Sauce is as varied as the nation's dialects. Whereas most market entrants speak with a southern accent, ours offers a subtler interpretation reminiscent of the central parts' milder climate, an area rich in crops and culinary history. Fresh and light with ample garlic notes, it is a perfect complement to stir-fry dishes, chow mein and fried rice. When it is mixed with fish sauce, the spicy nuoc mam takes on a gregarious personality that brings out the best of any Vietnamese dish. Black beans (fermented soybeans) are the keynote in the Yangcheng school of cooking, most evident in a mouth-watering sauce of a disputed provenance. As with any good idea handed down from centuries past, no one quite knows where this one originated, but all agree that the union of radish morsels with black beans, laced generously with dried chili flakes, give it a chunky consistency so good you will want to eat it by itself. 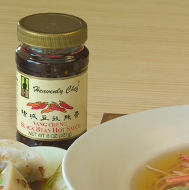 Eat or dip, our Yangcheng Black Bean Hot Sauce is a fiery accompaniment to Chinese noodle soups and dumplings.